Raising the Cup, that’s the only reason you play. The Cup to a lot of people is a character; something that is alive — a living, breathing entity. The Stanley Cup is shaped like a stout homunculus, its nine bands, two rings, collar and bowl forming the barrel chest, shoulders, and lapping chins beneath a head. From a distance it seems immaculate. Nearer to it, its engraved names can be seen, some of the 2,163 men who have won it. On close inspection, they’re set in hazy silver plates that are whiskered with scratches. Stippled dints and notches betray the trophy’s hollowness. Older bands weep oxidation. The Cup is made of the thing it holds. Inside its bowl are the 20 names of the 1907 Montreal Wanderers, a long scar zagging through them. In the fluting are more names. 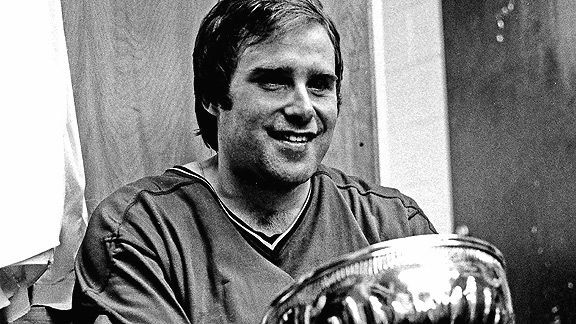 Many are strange — Kenora Thistles, Seattle Metropolitans, Si Griffis, Gizzy Hart — but all attest that for one spring, this man and this team knew something of glory. The Cup is always presented on a small table so that it’s level with the average man, though the trophy itself is 35.25 inches tall and 34.5 pounds heavy — about the size of a 3-year-old boy. The Cup is never cradled; it’s gripped at its base by a dominant hand and at the lip of its bowl by the other. In victory it’s hoisted and pressed overhead. Usually it’s pumped once or twice by its winner, as if he was skeptical of its weight, and then lowered to his face so that he might kiss it on a spot in its strata where if the Cup were a boy would be a bellybutton, less a kiss from the gasping player than a blown raspberry. The Right Honorable Sir Frederick Arthur Stanley, Baron Stanley of Preston, in the County of Lancaster, in the Peerage of Great Britain, Knight Grand Cross of the Most Honorable Order of Birth, and Governor General of Canada from 1888 to 1893 was a man who, according to his official biography, “had been susceptible to bouts of depression” and remained so over the course of his life. He never played a game of ice hockey, never saw his trophy contested. It was his sons who were overcome by the game when they watched the Montreal Victorias defeat the Montreal Hockey Club, 2-1, in 1889. Immediately after that game, Arthur and Algernon Stanley put up nets and constructed boards around the ice-skating rink at the governor general’s Ottawa mansion and created their own hockey team, the Rideau Hall Rebels. The Stanleys plus other upper-class sons and officers arranged games against the few teams that existed. They skated in red flannel sweaters, white caps, and white trousers, and lost often. One of Lord Stanley’s former secretaries was tasked with buying him a suitable trophy in London. At the George Richmond Collis & Company shop off of Piccadilly Circus, he found a foot-wide bowl, “a late Victorian electroplated silver punch bowl with a plain moulded rim above a repousse swirl-fluted and shaped band.” He bought it for $48.67 Canadian and had two plain inscription bands added, “From Stanley of Preston” and “Dominion Hockey Challenge Cup.” Under Stanley’s name was added the Stanley family crest, an eagle with its wings upraised, preying upon an infant in his cradle. Lord Stanley attached provisos to his original Cup letter, one of which was that winners must hand over the Cup to any challengers who defeat them. 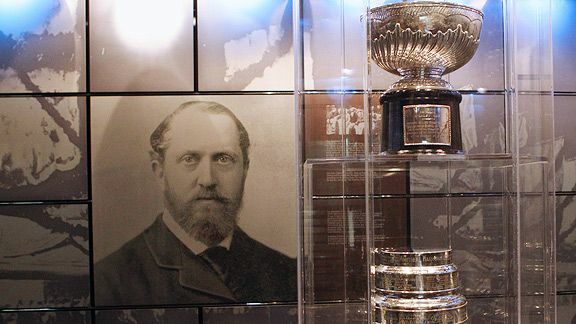 Another was that “each winning team, at its own expense, may have the club name and year engraved on a silver ring fitted on the Cup.” The engraving proviso reflected how routine Lord Stanley considered his trophy’s commission. It was a contemporary gesture, an imperial figurehead providing a little British pomp and oversight to a violent colonial game. Were a new band to be added to his trophy every season, it wouldn’t be long before the thing became top-heavy and flaccid, to sway until the year it toppled. When the Cup was brought before him in 1893, a British sportswriter asked Lord Stanley to describe it. “It looks like any other trophy, I suppose,” he said. I enjoyed the picture of my dad, finally, having the Cup. Then it was my turn; he and I, we kind of rotated around this ottoman and took some pictures. We danced for the first and only time in our lives that night, both of us moving around that ottoman. He was a good guy. On August 16, 1896, three men found gold at the bottom of Rabbit Creek in the Yukon Territory. They washed out $14,200 in eight days. Locals started staking claims soon after. One dug out $65.30 with every two shovelfuls of mud. Rabbit Creek was promptly renamed Bonanza; another near it Eldorado; and a third Hunter. One land surveyor estimated that the creeks held $79 million in gold. Word of the find couldn’t spread quickly from the remote Yukon. It wasn’t until 11 months after their strike that the first prospectors docked in Seattle with more than a ton of gold. The New York Herald reported that North America went “stark, staring mad on gold.” Of the millions who dreamt of going north, 100,000 actually left for the Yukon, men mostly, between the ages of 28 and 40. They carried their ton of supplies through British Columbia until they reached the shores of Lake Bennett, where they felled trees and built dugouts to navigate the Squaw Rapids and then 800 miles of the Yukon River. Thirty thousand of them made it to the gold country, where they formed a settlement that was hopefully named Dawson City after a land surveyor. Dawson City was built on a blade of mud cleared from the surrounding forest. It was bordered by a scarred mountain and backed against the Klondike and Yukon Rivers, 500 miles north and east of Anchorage, Alaska. Along its waterfront, the first arriving prospectors tied their boats together three deep and then built rough-hewn cabins wherever they pleased. False-front saloons came next, and then restaurants and sod-patched Edwardian hotels, tents pitched between in fungal clusters. For a time, Dawson City was the largest city north of San Francisco and west of Winnipeg. Liquor, gambling, and whores were the entertainment there, but some played ice hockey in the afternoon dimday. They played for hours, bonfires lit beside the ice after the sun went down, tea kettles skirting the flames. Putting yourself physically and emotionally at risk, that is when you grow as a player and grow as a person. Winning a championship is a fantastic thing, but being pushed in order to fulfill your potential is really the more satisfying thing at the end of the day. I know it’s cliché, but you learn about commitment. The Montreal Amateur Athletic Association added the first silver ring under the Cup in 1893 and left room on it for future winners. It was covered with staggered names and dates by 1902. In 1903, rather than buying yet another ring, Montreal inscribed their names onto the bowl. The 1906 Montreal Wanderers found unoccupied space on the decorative fluting atop the bowl and inscribed their names there. The 1907 Kenora Thistles inscribed themselves inside the bowl. When the Wanderers reclaimed the Cup from Kenora, they became the first club to have inscribed the names of all their players and executives. This didn’t become tradition until 1924. Beginning in 1927, every winning team added a silver band etched with the names of its entire organization. By the 1940s, the Cup was 18 thin rings tall. Players called it the “Elephant Leg.” The league recognized the need for a redesign and entrusted the Cup to a Montreal-based Danish silversmith, who rebuilt it once in 1948 and again in 1957, that one becoming the modern Cup. The modern Cup’s bowl, and the four bands, two rings, and collar beneath it, are unchanging. The winners they contain date from the birth of the Cup to the 1929 Boston Bruins. On a barrel below them are five interchangeable bands, each containing enough room for 13 teams’ worth of players and personnel. The fifth band is always incomplete; as soon as it’s filled, it becomes the fourth, and what had been the first is removed from the Cup and placed in a vault in the Hockey Hall of Fame. A modern player’s name will remain on the Cup for 64 years. The next ring retirement is scheduled to occur after the 2016-17 champions are added. There will come a day when none of Gordie Howe, Bobby Orr, nor Wayne Gretzky is on the Stanley Cup. By the mid-’60s, the NHL was concerned that the bowl’s silver-nickel alloy was becoming fragile, the Cup liable to pulverize like elder bone. The league secretly commissioned a replica “matching every scratch, each name, absolutely perfectly.” The Danish silversmith’s replica bowl was so detailed that he included bite marks left on the original. The replica bowl (atop the 1957 redesigned bands) is what is won by modern Stanley Cup champions. It’s known as the Presentation Cup. There was yet a third Stanley Cup made in 1992, a replica of the replica that goes on display in the Hockey Hall of Fame whenever the Presentation Cup is on the road. The original bowl remains under glass in the Hall’s vault. This was what we all dreamed about as young boys. Winning the Cup was the fulfillment of everything I had worked my whole life for. Then when I came to the bench, there was Mikey Peluso, our tough guy, just bawling uncontrollably. At the start of the last century, most Dawsonites had given up hand-mining their own claims to work in mining corporations begun by successful prospectors. The most successful of them was Joseph Boyle. Boyle was a boxer and businessman, tall, broad, and booming. Throughout his life he was inclined to flights of fancy, disappearing at 17 after noting: “I’ve gone to sea. Don’t worry about me. Joe.” For three years his family believed him dead while he sailed around the world in the barque “Wallace,” once diving into the ocean with a knife in his teeth to save a shipmate from a shark. He would later leave his first wife, his children, his family’s horse business, and his boxing career to rush the Yukon. He made his first million from his gold and timber concerns by the time he was 30. He was restless and possessed of an enormous self-confidence, the “King of the Klondike,” the one in 100,000 who went north and struck it big. Boyle was a former hockey player, and in 1902 he built Dawson City an arena — complete with electrical power plant, training rooms, lounges, and saloon — that rose three stories above the slag and bald hills surrounding it. Spectators paid a dollar to watch the teams of his four-team league: the North West Mounted Police, the Dawson Amateur Athletic Association, the civil service, and the general population. In 1904, Boyle selected an all-star team from his league and used his sundry business connections back east to get his formal three-game challenge for the Stanley Cup accepted. The reigning champions were the Ottawa Hockey Club, known then as the Silver Seven. In the previous two years, they had won the Cup in a league playoff and defended it from a record five challengers. They were the first Stanley Cup dynasty, and they were not much loved outside of the capital. The Silver Seven represented the seat of power, money, comfort, and eastern primacy. Three of their skaters had played together for nearly a decade. Three also started on the Ottawa Roughriders football team, one as the quarterback. One was into the sixth year of his heavyweight boxing title. Six of the seven would be inducted into the Hockey Hall of Fame. Ottawa’s best player, and hockey’s first real star, was “One-Eyed” Frank McGee. McGee was an Ottawa aristocrat, the son of the Clerk of the Privy Council and the nephew of one of Canada’s founding fathers. Four years earlier, during a charity match played to raise money for the Canadian effort in the Boer War, an errant stick had shucked McGee’s left eye from his face. But when he returned to hockey, his new dead eye didn’t prevent him from averaging more than three goals per game. A finesse centerman, McGee could nonetheless lower a shoulder and physically dominate if his quick temper was stoked. Boyle wanted to be the one to beat McGee and the Silver Seven. It was partly a business decision: His novel mining team was the perfect advertisement for his timber concessions, saw mills, and shipping docks. But it was also consistent with what lured him to the Yukon in the first place: an indestructible prize to work after, a solution to seek. If his team won the Cup, Boyle figured it would remain perched over the bar in his arena forever. Any team that dared challenge him would have had to cross the Chilkoot and Dead Horse passes roped together in antlike columns before walking hundreds of miles up the frozen Yukon River to Dawson City. Of the roughly 7,090 men to have played in the NHL, around 1,180 have their name on the Stanley Cup. A modern winner will have played between 104 and 116 games from September until June, an ordeal that according to one player required “you play, you sleep, you wake up, you have a training meal, you practice, you sleep, you wake up, you play, and then you do it all over again” for 10 months. The longest any one team has been the Cup’s champion was for the 1,832 days the Montreal Canadiens claimed it from 1956 to 1961. The briefest champions were the Kenora Thistles, who claimed the Cup for 63 days. Jean Beliveau claimed it 17 times between 1955 and 1993, the most ever. In the ’70s and ’80s, the winning teams’ captains and stars could share the Cup for a week or two. With the 1994-95 New Jersey Devils began the current tradition of allowing each member of the winning club his one day with the Cup, a custodian supervising it at all times. The first champion to name his child after the Cup was Georges Vezina in 1916. The first to christen his in it was Sylvain Lefebvre in 1996. The first to take it to his father’s grave was Brendan Shanahan in 1997. So, in the quest for anything that is worthwhile, you have to be willing to hope for it — which is so hard, because chances are it won’t turn out — and that can be extremely painful. You hope big, and you hope hard, and you make yourself completely vulnerable in the process. The Dawson City Nuggets, as Boyle called them, averaged 160 pounds a man. His forwards were Hec Smith, George “Sureshot” Kennedy, and Norm Watt, all prospectors who’d rushed to Dawson in 1898 and failed to strike it rich. Smith was a slight Native American. The forward pass hadn’t yet been legalized, so he was the spearhead of Dawson’s offense, carrying the puck up ice and stickhandling through defenders easy as practiced hands braiding leather. Sureshot Kennedy patrolled Smith’s left wing. He was a solid man whose wide miner’s forearms were fanned with deltic veins. He was one of the first to be described as having a “heavy” shot. Fired in stride, Kennedy’s shot seemed to gain mass and density in flight before rattling spent in the cage behind goaltenders. Norm Watt was a vicious right winger one head shorter than most on the ice. His style of play marked him as an ur-agitator: He squawked at opponents while flitting around the rink, leading with his stick extended like a curious snipe’s beak. He threw dirty hits, but suffered others’ poorly. On defense was J.K. “Gloomy” Johnstone, a Dawson constable in his early 20s who worked with Norm Watt at the post office. His game was hardy and unassuming, what would now be called stay-at-home defense. His partner was Lorne Hannay, who had lost to the Silver Seven the year prior as part of the unsuccessful challenge of Brandon, Manitoba. Dr. D.R. McLennan played the now-extinct position of rover. He had lost the Stanley Cup to the Montreal Victorias in 1895 as a member of the Queen’s University team. He was the only Nugget to skate with a full Victorian mustache, waxed to points. In goal for the first time in his young life was Albert Forrest, 17. Forrest was born in Trois-Rivieres, Quebec, to a man who took his family with him to the California gold fields. When his father ran off to mine Dawson, Forrest pursued him north, stumbling in off the Chilkoot a hard and silent 11-year- old. He was the ace of the Dawson Amaranths rotation (14 strikeouts his record), and he had swept the skating competitions at the previous two Dawson Amateur Athletic Association winter carnivals. A pure athlete but also pugnacious, fat-lipped, and sullen. In net he gave notice to those who would crowd his crease by chopping at their ankle bones. The Nuggets’ captain and coach was Weldy Young, an older gentleman “with a permanent scowl on his face.” Young starred for the Ottawa Hockey Club from 1893 to 1899, their “only world-calibre hockey player in the early 1890s.” He was staunch and domineering on the back end, one half of the era’s greatest defense pairing. Opponents called him a thug. Young was also credited as the first defenseman to wind up behind his own net and lead the rush up ice. He lost the Stanley Cup to Montreal in 1894, was charged with brutality in a game in Quebec in 1895, and left Ottawa in disgrace after that when he climbed into the stands and attacked a loudly critical home supporter. In 1900 he followed the gold dream to Dawson, where he staked the largest dump on the lower reaches of Dominion Creek. He never hit pay dirt, and he supported himself by working as an administrator in the Dawson recorder’s office. Had he stuck with Ottawa, he would’ve been a part of the Silver Seven Cup dynasty and most likely a future inductee into the Hockey Hall of Fame. So from top to bottom you have an environment where everybody truly cares about each other — not only as hockey players, but as human beings. On December 18, 1904, Hec Smith, Sureshot Kennedy, and the team trainer left Dawson City by dog sled. The rest followed the next day on bicycles because there was little snow on the frozen ground. They were traveling 330 miles to Whitehorse, the nearest Yukon city. From there they planned to board the White Pass & Yukon Railway for Skagway, Alaska; then they would travel by steamer to Vancouver, where they would take a train to Ottawa. They all were paying their own way — $3000 in all — for the chance to steal the Stanley Cup north and hide it away forever. One newspaper stated that “these hardy northerners rolled and tumbled in the snow like kittens at play all along the long journey, stopping occasionally for a snowball battle.” According to the Ottawa Evening Journal, a much more accurate newspaper: “The first day the Klondikers covered 46 miles, the second 41. The third day saw them struggling to cover 36 miles, some suffering with blistered feet. To proceed, these had to remove their boots. It may give an idea of the hardship they faced when it is recorded that the temperature sank to 20 degree below zero during the mush.” They left their broken bicycles and useless dog sleds behind and walked barefoot through primeval forest, the only noise the wind that buffeted them and burned their faces. Eleven days later they arrived in Whitehorse. They were mobbed by well-wishers and put up in a hotel. While they slept, a blizzard blew in and crippled the railways. When they finally arrived by rail in Skagway, three days later, they were again feted by a huge crowd. Word of their trial had reached as far as Nome. The ship they had planned to take to Vancouver had waited a day for them before departing two hours before their arrival. They spent three more days in Skagway. For spectacle moreso than fitness, Dr. McLennan took them daily to the Skagway River where they stripped down and plunged into the freezing water. Weldy Young had been held back in Dawson City. His position at the recorder’s office required that he stay and oversee the December 16 federal election. Boyle had tried earlier to have the games postponed so that the team could leave with Young, but to no avail. When Young heard that his teammates were delayed, he took off for Ottawa as soon as all the votes were tallied. More than any other Nugget, he wanted to take the Stanley Cup from the team that had won it again and again as soon as they were rid of him. As Young was leaving Dawson, the rest of the Nuggets were boarding a steamer for a three-day trip to Seattle. The ship weaved between the coastal islands of the Inside Passage to avoid bad weather, but the sea was still roiling. The Nuggets tried to jump rope the first day but were soon incapacitated by seasickness. What little they ate they vomited over the rails until they had exhausted themselves. The strongest and most memorable emotion that I had when we won it was love. Immediately, it was love. The love I felt for my teammates at that moment was almost overpowering. I wanted to stay together with them forever and ever; I never wanted that moment to end. The work of engraving the presentation Cup and its replica has since 1989 been entrusted to Louise St. Jacques, who for 10 days each August or September makes room in her Montreal home for the trophies. She is given a list of 52 names by the winning general manager. To be eligible for the list, a player must have: played in 41 regular-season games; have been on the active roster by the 26th day preceding the end of the regular season; or played one shift during the Stanley Cup final. Any spelling errors are not hers; St. Jacques engraves only what’s on the list. But over its long history, the Stanley Cup has had the names of hundreds if not thousands of men carved in trespass upon it. B. Morris, S. Van Sickle and H.L. Linall, F. Brandt, J. M. Kirkpatrick, G.C. Donaldson, and J.E. Pigeon are just some of the unknown charlatans. R.T. Garner scrawled “long lives Canadiens.” Someone decided upon “Bow Wow.” Weldy Young used a penknife to add himself on the bowl below the Stanley emblem of eagle and child. The Stanley Cup is the Holy Grail. It’s why we play this game. Dey’s Arena was a low building of brick and wood at the edge of Ottawa. 2,200 spectators shook its elevated bleachers; the building smelled of sawdust and grease. The wan filaments in glass bulbs strung above the ice pushed the gloom to the corners of the rink. The Dawson City Nuggets lined up on the cloudy ice opposite the Silver Seven one day after their arrival. They chafed in the brand-new sweaters Joe Boyle bought them: black trimmed with gold claimed by some to have been spun from Yukon ingots. Governor General Earl Grey dropped the puck. The Silver Seven came out strong and tried to overwhelm Dawson City. They pressed in on young Forrest, who stood strong in his crease and made several outstanding saves in the early going. The Nuggets could only counter with shots from distance. Norm Watt’s forehead was sliced open when he was body checked by an Ottawa player who carried his stick high; Watt fought him, and both were sent off. For nine minutes the pace was electric and the game scoreless. Dawson at last generated a good scoring chance on Ottawa’s net, but one of the Silver Seven picked up the rebound and leveled a pass to McGee, who fired a shot through defenseman J.K. Johnstone’s legs and past a screened Forrest, 1-0 Ottawa. Two and a half minutes later, McGee assisted on another goal, 2-0 Ottawa. Dawson pressed. Small, insurgent Hec Smith raided Ottawa’s end but was stopped. Then the Silver Seven scored again, 3-0. Dawson surged off of the following faceoff. Hec Smith flew between the Silver Seven in their own zone like a lightfoot in a familiar wood. He got the puck to Dr. McLennan, who shot it home, 3-1. The Nuggets piled atop McLennan and screamed as though what it was they set out to do were done. The Silver Seven leaned on their sticks and watched them, bemused. The two teams pushed the play into equilibrium. Halftime was called at the 30-minute mark, Ottawa up only two goals. For 30 minutes, Dawson City had matched the greatest hockey team in the world almost stride for stride. The second half started tentatively, both teams content to simply clear the puck from their defensive zone. But as the game wore on, Dawson’s play became ragged. Ottawa scored to make it 4-1, and then stopped Dawson on two scoring chances. The Silver Seven began to possess the puck in the offensive zone with crisp combinations and fluid movement. Together they worked over the Nuggets’ defense as though picking at a stubborn knot. Dawson’s turns were no longer tight nor their stops sharp. Ottawa scored — 5, 6, 7-1. A frustrated Albert Forrest slashed one of the Silver Seven and was sent off. Lorne Hannay filled in for him, and Ottawa scored two more. Later, Norm Watt tripped a defenseman who responded by slashing him on the mouth. When no penalty was called on the play, Watt charged the player from behind and broke his stick over his head, knocking the Ottawan unconscious. The Nuggets went shorthanded for the rest of the game, 9-2 the final. According to the Ottawa Evening Journal, the Nuggets “could hardly stand on their skates and they went to their hotel as limp as wet rags.” But they were unbowed. Albert Forrest complained that six of Ottawa’s goals were offside, and even the Journal admitted that three shouldn’t have counted. Two others were scored after Hannay was forced to play goal. The Nuggets hadn’t been allowed to play any warm-up games en route to Ottawa and were missing their best player and felt terribly out of shape, but to their minds it had been a 2-1 win. The Journal somewhat agreed: “It was only when the Yukonites tired and showed the effect of their long journey that Ottawa began to pile on the score.” They were buoyed by the thought of Weldy Young joining them if they could win the next game and force a third. And they had held “One-Eyed” McGee to a single goal. Ever since, when it has come to the Stanley Cup, a distinction has been made between injured players and hurt players. An injured hockey player can sit out the game, blameless. But if he’s only hurt, he’s expected to play. Over the past century, playing hurt for the Cup has meant: separated shoulders, facial lacerations, back spasms, bleeding eyes, bruised ribs, broken ribs, broken teeth, jaws, wrists, fingers, hands, toes, and feet, torn thumbs, torn labrums and anterior cruciate ligaments, fractured skulls, concussions, and pestled cartilage. Beginning with the doctor of the ’47 Toronto Maple Leafs (whose kit included leeches), team physicians have been stamped alongside players on the Stanley Cup. Marcel Pronovost played the 1952 finals on a severely broken ankle, recasting it after every game. Bobby Baun scored the sudden-death winner in the same game of the 1962 finals in which he had broken his leg. Fearing a cast, he hid from team doctors after the win. He snuck onto the bench for game seven and didn’t miss a shift. It is the realization that your dreams are actually coming true. What is so neat about that is the fact that in sports or in life, most people rarely will ever have that opportunity. I wish everybody could experience it just once. The second game began with the ferocious pace of the first. Ottawa scored early when four of the Silver Seven traced a tessellation of short passes that ended inside the net. They added another immediately after and continued to besiege Forrest in his crease. He stymied them for several minutes, his only equipment a black toque, hockey stick, and brown cricket pads covering his legs. And then Hec Smith scored on a counterattack. Again the Nuggets fell over themselves in a flagrant celebration. This time the crowd exploded with them, perhaps understanding what they were witnessing: men standing as if before a Fury, holding their own in its face but barely, sneering at its strength, daring it gale harder. For the 10 minutes they had their legs, Dawson City was only one goal worse than Ottawa. Then, with the previous night’s insult fresh in his mind, Frank McGee took control of the game. He “was better than they said he was,” according to one Hall of Fame coach. “He had everything — speed, stickhandling, scoring ability, and he was a punishing checker. He was strongly built but beautifully proportioned, and he had almost an animal rhythm. When he walked around the dressing room you could see his muscles ripple. They weren’t the blacksmith’s muscles either. They were the long muscles of the great athlete. You don’t see many like him.” After it became 3-1 Ottawa, McGee scored twice in 40 seconds. He scored twice more before the halfway point of the game. He played like something ineluctable, a force of nature. He scored seconds into the second half. He scored two more goals within 30 seconds. Then again a minute later. Then 10 seconds after that. McGee seemed to grow stronger and more unrelenting even as Dawson grew weaker and more defenseless. Following each goal he skated to center ice to crouch with his stick on his knees and his eye on the faceoff dot, ready to do it again. McGee scored 14 goals in all, his punishment for Dawson’s journeying all that way thinking themselves not only equal to but better than the Silver Seven. When the score was 23-1, with little time on the clock and seemingly nothing left for the Nuggets to play for, Sureshot Kennedy dredged what little spirit was still in him and lugged the puck up the left wing through several of the Silver Seven. He tossed a blind, hopeful pass across the ice toward Hec Smith, who slapped it into the net. The game was called, 23-2. It’s that moment of ultimate freedom, where you have license to feel great, you have license to do almost anything and people will not only understand but they will love to watch you do it. You want to celebrate and people want to celebrate with you and you don’t want it stop. There was this feeling that the moment you stopped, it would all be over. And then you’d have to go home and the license to feel as you did and to do as you did would be gone, and you’d have to take out the garbage and get back to being everybody else. I immediately came to the realization that arguably the greatest time I have ever had in my life had now just come to an end. After losing the Cup, the Nuggets played 23 exhibition games across eastern Canada, winning as many as they lost and recouping some of their travel expenses. The Stanley Cup trustees amended their rules for the next year: no longer would just any team be allowed to challenge for the Cup. Albert Forrest was the only one to return to Dawson City; he walked from Whitehorse alone. “One-Eyed” Frank McGee retired after the Montreal Wanderers won the Cup from the Silver Seven in 1906, ending their streak of 10 straight Stanley Cups. A decade later he cheated on a vision test in order to serve in World War I. He died during the Battle of the Somme, the only Hall of Fame athlete to ever have been killed in action. His body was never recovered. Ottawa engraved their win on the lip of the Stanley Cup: “OTTAWA 1905” and below that “Ottawa vs. Dawson.” The engraving is on the original Cup, the replica Cup, and the presentation Cup; Dawson City will never be consigned to a vault. Assuming the average player’s palm is about six inches wide, there is a one-in-six chance that when he grips the Cup by the bowl to raise it, he’ll burnish Dawson with the heel of his hand. When I picked it up I couldn’t believe it. The thing is lighter than a feather. It was almost like anything but ‘that’ would never feel right again. The story of Dawson City’s challenge is repeated in almost every work of Stanley Cup history even though it is only half-known. There are the specifics: the men who played, the voyage they took, the scores of their games and the general shape of the play. These come from a few yellowed and crumbling newspaper stories and the eyewitness accounts of the long-dead. The specifics of this story alone have warranted its perpetual retelling. But it is what’s missing — whatever made Joe Boyle assemble the Nuggets in the first place; whatever was going through their hearts and minds as they suffered their humiliation; whatever would have been the tale’s emotional and psychological connective tissue — which makes the story such a pervasive one in the hockey world. What isn’t and can’t be known about the most impossible attempt at the Cup is far more tantalizing than what is. History won’t complete the Nuggets’ story, so every one of its tellers has had to fill in the rest himself. He has had to give the story context, and provide it the best explanation he could. History enlivens what is known, imagination, what might have been and still might be. Neither is adequate without the other. The specifics of the Nuggets’ challenge were always only the bare bones; it has been the storytellers’ interpretations that, like ligature, granted those bones support and power. The half-known story of Dawson City belongs to a genre in which the most ancient and famous example is the legend of the Holy Grail. That story began as an unfinished twelfth-century poem. In it, a 15-year-old boy wanted to become a Knight of the Round Table, so he searched for a “graal,” a medieval French noun that was a play on the verb “to delight.” The grail of that story was a large gold dish inlaid with gemstones. Its creator died without having explained its provenance, or the question he himself put forward: “Whom does the grail serve?” In the 50 years following its publication, that story received four continuations by authors who tried to account for what the grail was and why it was important. For nearly a millennium now, other writers have created their own works around the grail. Imaginations have compounded imaginations, and the grail has become the Holy Grail: the cup Jesus used at the Last Supper; or the cup Jesus drank from during the crucifixion; or the bowl Joseph of Arimathea used to collect His leaking blood. In some Grail stories, it became a part of the Christian Mass or the center of its own secret rite or divorced from religion altogether. In all of them, though, the Grail was found only by those who made themselves worthy of it by enduring long, trying quests. The Holy Grail, then, is a collective invention, formed like anything precious by the pressure of accretion, a thousand endings on top of one unfinished story. It has become important because people imagined it to be. To them it represents perfection, fleeting if at all possible. The answer to the question, “Whom does the grail serve?” Those who know its true nature. Joe Boyle promised the Cup trustees he’d be back for their trophy. But he, too, entered World War I and never returned to hockey. But by men with the hearts of Vikings, and the simple faith of a child. Kent Russell is a writer from the microwaveable insta-Bettman hockey city of Miami, FL. His other stuff has appeared in n+1 and Harper’s.